8MM Tungsten Carbide Wedding Band Round Cut CZ Bridal Men Ring Size 11 | What Should I Say? 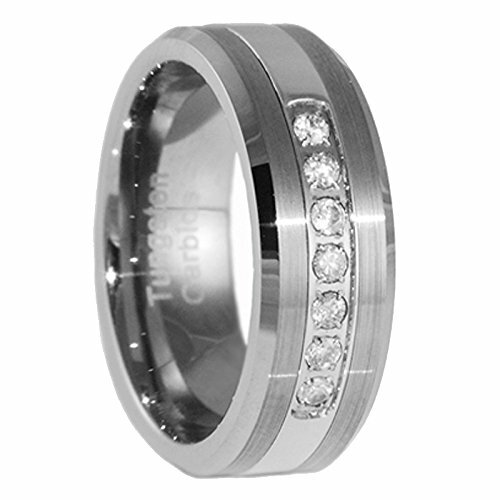 If you are looking for a cool Tungsten ring, this is it! So stunning, with such intricate attention to detail, and so affordable. Tungsten is 10 times harder than 18K gold, 5 times harder than tool steel and 4 times harder than titanium. It measures between an 8 and 9 on the Mohs scale, with diamonds being the highest at a 10. Tungsten has been used for decades in industrial applications where only the strongest and hardest metal will suffice. The incredible strength and timeless beauty of our tungsten rings will have you cherishing them for a lifetime. All of our rings are manufactured with tungsten carbide using nickel as a binding agent. Many companies choose to use cobalt as a binder because it is slightly cheaper. While either element will work just fine, cobalt has a higher tendency to have adverse reactions with some people's skin. This is why we use nickel. Although in some extremely rare cases a customer will discover he or she has an allergy to nickel, our rings are generally considered to be hypo-allergenic. If you have any questions about this product by CoolMetals, contact us by completing and submitting the form below. If you are looking for a specif part number, please include it with your message.